Rotary engraving, laser engraving and full-color imprinting for plaque available on request. 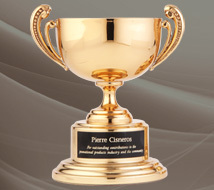 Direct cup engraving is available for some cups. All items are made of solid jewelers bronze. All items are coated with clear baked enamel to avoid tarnish. Height does not include figurines. Prices do not include figurines. Copyright © 2019 Saxton Industrial. All rights reserved.